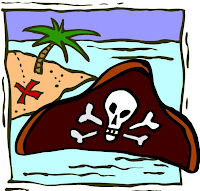 What's New @ Roselle Public Library: It be "Talk Like a Pirate Day!" It be "Talk Like a Pirate Day!" Ahoy mateys! Be ye ready for some swashbucklin' and carousin'? It be "Talk Like a Pirate Day!" You can "be wise in the ways of pirate parley" with Mango's Pirate Language course! Access Mango Languages in the Library or at home and select "Pirate" from the list of courses. You'll be learnin' the proper way to hail yer cap'n and get yer landlubbin' scalleywags a-sailin' smartly on the high seas! Of course, if you prefer, you can select one of the other 44 languages and learn to speak that language like a native.